We enjoyed a very peaceful night on the Aire at the Meung-sur-Loire. Once up and scrubbed we drove down to the 'Hyper U' supermarket where The Chef went in for some bits of shopping, then it was off to their filling station to top the tank up. We always avoid refuelling on toll roads as it is so much more expensive, a bit like back home at the motorway rest areas. Then it was off towards Calais. I had anticipated the journey taking two days, the second being a short one, followed by some shopping at Cite Europe, the large shopping mall, next to the Channel Tunnel complex, on the outskirts of Calais. As it turned out, we've completed the journey in just one day, though a very long day. 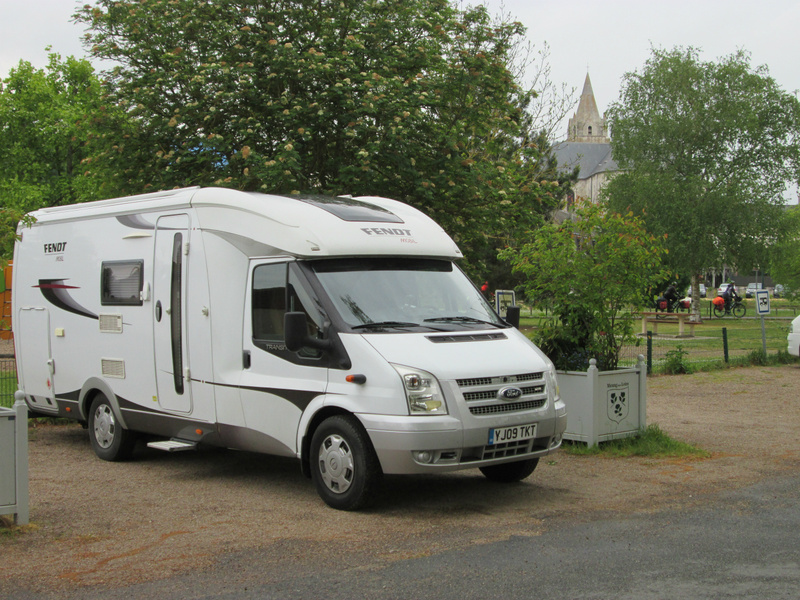 We had problems in Chartres where all the HGV's who know better, made a left turn at a roundabout on the outskirts of town to bypass it, leaving us dummies with rubbish satnavs to go straight ahead, all the way through town driving on a dreadful road surface. So here we sit in the large car park at Cite Europe, having been for a walk around the shops and had an evening meal at one of the restaurants, though nothing like fine dining. This evening I will book a crossing with Mr Peando's multicoloured ferryboat service for about mid-day tomorrow in the hope we can arrive home before the worst of the Friday night rush hour traffic. So that's this trip done with. It's seemed a long one this time, we'll be pleased to get back, though not for the weather. As there was almost nothing of France featured in the end, I will rename the trip 'Spain 2017', which would be a more accurate description of it. Once we have received the costs of the French toll road expenses allowing The Chef to complete the costings of the trip, I'll post them under a separate heading, something like 'Expenditure', so that those who may be tempted to make the same trip will have some idea of the costs involved. For those of you who have followed the tales of our misadventures - thank you. It makes the effort of producing such rubbish worthwhile, though it has seemed hard work at times. Our next trip is scheduled to be September, where we'll be covering a lot of old ground in Provence and the coast of the Cote de Azure. For that reason I'm not going to cover it on the blog. This will give me more time to spend with The Chef in the evenings. The possible Grand Finale for the blog will be starting about mid April 2018 when we'll set out for a three month trip through Italy, over to Greece, through Albania to avoid the ghastly Eastern European countries we passed through on the way back from Turkey, then in to Croatia, then Slovenia,across the top of Italy, in to France, then home. That should be a good one, and will require a lot of planning. In the meantime there are jobs to do on the motorhome, including the installation of a refillable LPG system, and before the trip next year, a complete set of new tyres. I hope you'll want to return to the blog then, and join us as we face Europe perhaps for the last time before Brexit. Finally for those who read this blog in bed as a cheap cure for insomnia, I'm sorry, but for the next year you're going to have to go and buy medication instead.